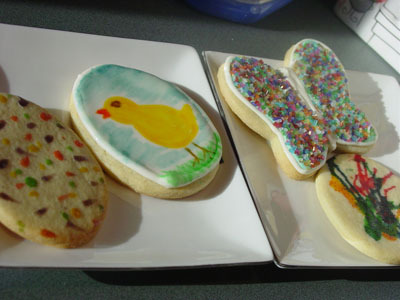 I’ve been having a nice email conversation with Rachel, a reader, and after I mentioned I was baking some cookies for Easter, she was kind enough to send me a slew of cookie decorating ideas & tips. They’re great; take a look! Idea #1: Leave the dough on the counter for 5 or ten minutes before rolling it out so it’s not SO hard to roll out. I recommend rolling it out on marble or granite if you have a counter or cutting board made of it. Idea #2: Take a few ramekins and put a beaten egg in each. Mix in any food coloring you’d like (for this I would use liquid, not gel food coloring). Be sure to mix well. 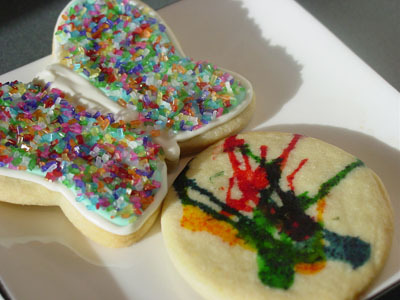 Take a small paintbrush (I buy kids’ disposable watercolor brushes because the food color is messy), “paint” your cut out cookies with it, and bake as you normally would. This gives a great “stained glass” type of effect and it’s very shiny after baking. When put on a platter with cookies done with royal icing, it’s a great contrast of cookies/effects. Idea #4: When mixing royal icing in the Kitchen-aid, cover the bowl with a damp towel while mixing small batches of colors so it doesn’t dry out. 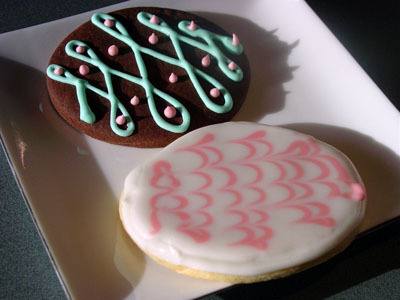 Idea #5: Put fresh batches of colored royal icing directly into the piping bag. Then, take a tall drinking glass, and put a “wad” of wet paper towel in the bottom of the glass. Put each colored piping bag in its own glass like that. This way, they are standing up straight, they don’t get dried out at the tip, and you can see what you’re working with. Idea #6: When you want to cover an entire cookie in royal icing, pipe icing around the border first, and let harden for a few minutes. Then go in and “flood” the cookie within the border with the remaining royal icing (you could make a thinner batch of icing for this–just add more water). Nothing slides off the sides and you get a nice glossy, even coat of icing on the cookie. Much more so than using an offset spatula. B) Allow the flooded icing to dry completely (I suggest overnight). Then, place drops of liquid food coloring onto a plastic plate, blending colors as you like. 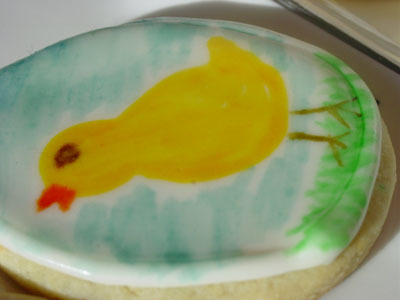 Using a paintbrush, dip the brush into the food coloring and paint images onto the surface of the cookie. The effect is similar to watercolor painting. 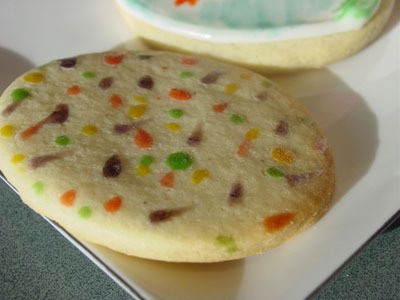 C) Instead of icing a cookie, drop dots of food coloring on the surface of a baked cookie. Then, using a straw, blow the food coloring across the top of the cookie. You’ll be a culinary Jackson Pollock.